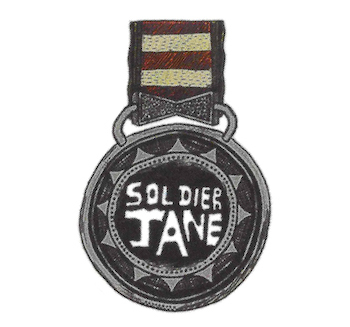 "Soldier Jane" can be found on The Information. The song is a lowkey one, that still manages to stand out. That is, the music feels restrained, staying calm and steady, which is what propels its grooviness. When asked about the song, Beck talked about James Gadson, the drummer, and how they played him lots of Krautrock, so the song has a "Germanic thing going on." On top of that mechanical rhythm though, Beck and Nigel Godrich created a beautiful melody and some terrific atmosphere. After that verse though, the song develops from there. Verse two is all about trying to give a sign to someone ("drag canes across the gates", and lighting candles). (Also I'll add that 'dragging canes' line is perhaps my favorite imagery in any Beck song.) Lovers and gamblers take chances, they are alive. Jane needs to learn from them. There's a candle on the windowsill, and she won't see it. Get out of your shell, Jane. The same point is made with the contradictions in the last verse. Life may hurt (like a knife), or be blinding (like the stars), or even drive you into the ruins (like a car), but it may also remove the darkness, cure the poison, or lead somewhere better. On The Info tours of 2006-2007, "Soldier Jane" showed up on occasion, at about a third of the shows. JMJ left the band for this tour, and "Soldier Jane" went with him. It did show up twice only, once at a show in Amsterdam and another time in Tokyo. JMJ returns, and yep, so did "Soldier Jane." There weren't a ton of shows these years (just 37), but "Soldier Jane" was played 22 times. "Soldier Jane" continued in many sets on this tour, played about half of the time. "Soldier Jane" slipped away a little at this point, but did show up 3 times in 2015 and then once in 2016. The latter was JMJ's final show with the band, as well.